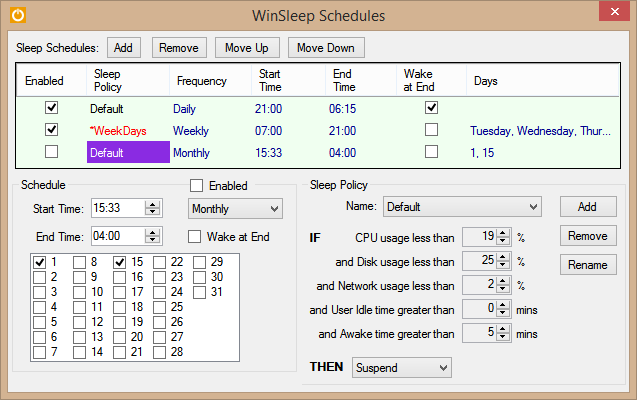 WinSleep - A Windows sleep program by MollieSoft. Save money on electricity! Discover the new Windows sleep program that saves you money! Download the 30-day free trial. Current Version: 1.5.2.0, released March 22, 2019. New! 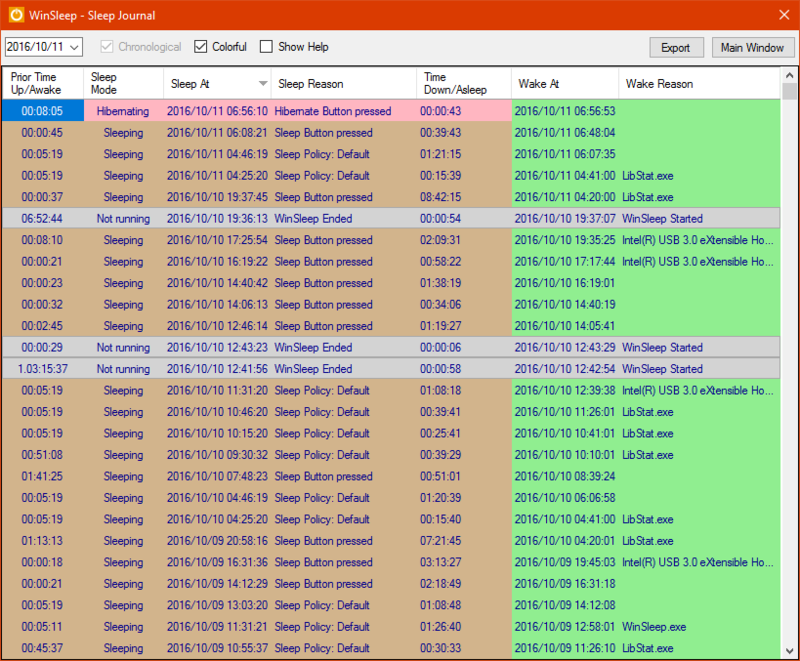 Get the free remote viewer WinSleep Monitor to see your WinSleep from anywhere! Keeps your computer asleep (while not too busy) as much as possible during periods you specify. Provides a detailed time-line graph showing when your computer was awake, asleep, or hibernating. 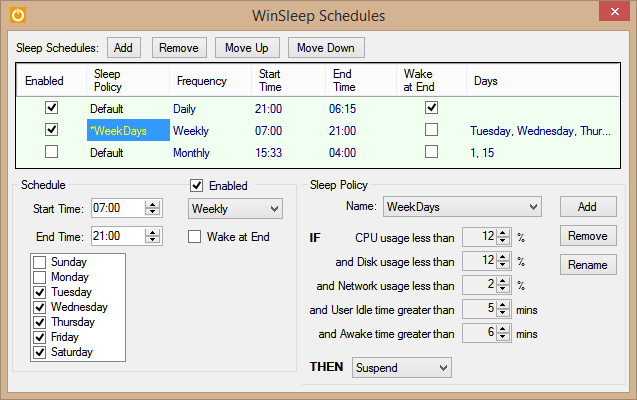 WinSleep is the only Windows sleep program with this feature! Sleep Journal shows when/why your computer woke up or went to sleep. Define multiple sleep schedules (daily, weekly, or monthly timeslot), each with a designated sleep policy with its own cpu/disk/network usage limits. Set wake schedules and an optional task to be run at each wake. Helps prolong the life of your desktop computer. Your disk drive is not spinning, motherboard is not powered, fan is not running (and accumulating dust inside the computer casing), and your monitors are in standby mode. A typical scenario - Windows Update may wake your computer at e.g. 2 a.m. - but WinSleep can put it back to sleep once the update processing is over! Stay in touch with your WinSleep when you are away from home! 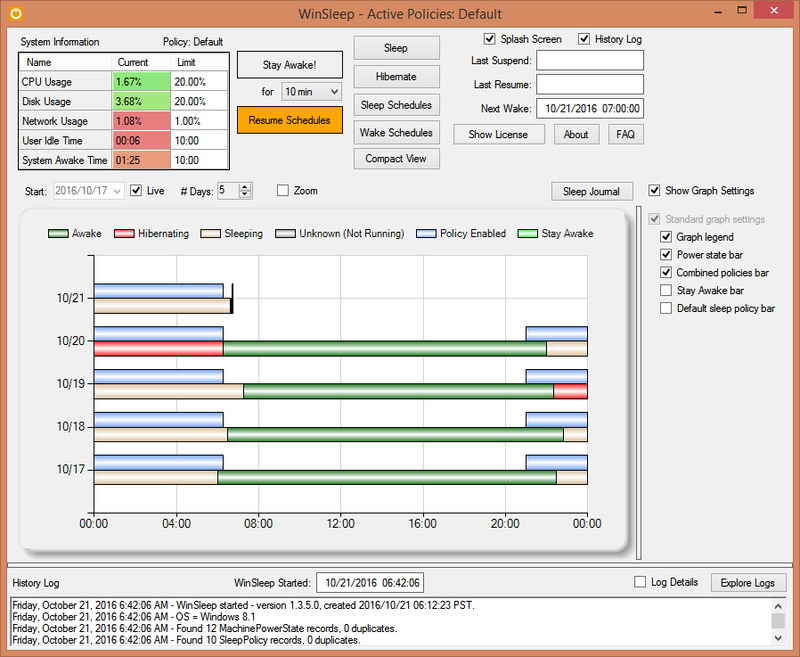 The free program WinSleep Monitor can be installed on a remote computer to see when your home computer was awake or asleep. 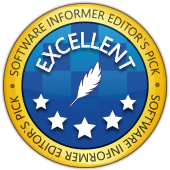 Read the Editor's Review at FindMySoft. 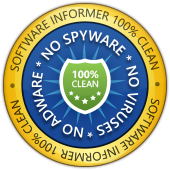 Read the Software Informer Review. 1.5.2.0 - Handle anomalous sleep/wake records. 1.5.1.0 - More reliable read/write for configuration file. 1.4.12.0 - Various minor stability fixes. 1.4.11.0 - Some cosmetic fixes. 1.4.10.0 - Added "Cancel Sleep Countdown if busy" checkbox to the Preferences dialog. If this is checked, and the machine then becomes busy during the Sleep Countdown, the sleep attempt will be cancelled. 1.4.9.0 - Prevent spontaneous cancellation in Sleep Dialog when usage limits are exceeded. Minor stability fixes. 1.4.8.0 - Fixed timeline issue for multi-day awake periods. 1.4.7.0 - Fixed date limit issue in timeline for midnight power state changes. 1.4.6.0 - Deactivate all schedules on Sleep Schedules remote update, then reactivate. 1.4.5.0 - Added support for Monitor remote edit of Sleep/Wake Schedules. 1.4.4.0 - Stay Awake period is now attached to the Wake Schedule instead of the associated Task. 1.4.3.0 - Updates for Monitor 1.2.3.0. 1.4.2.0 - Respond to Monitor commands for Sleep and Hibernate (Monitor version 1.2.2.0 or greater required). 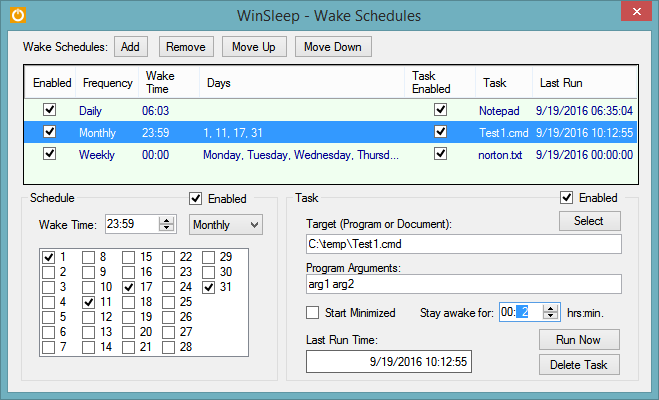 1.4.1.0 - Added support for WinSleep Monitor. 1.3.8.0 - Added Preferences dialog for miscellaneous settings. 1.3.7.0 - Added Show Help for Sleep Settings and Wake Settings windows. 1.3.6.0 - Show history log in a separate view if desired; added Window menu button at top-right of secondary views, to assist navigation. 1.3.5.0 - Added new "Graph Settings" panel to replace the time-line graph context menu. 1.3.4.0 - Add missing program-end record in case of a forced shutdown; more robust config file read/write. 1.3.1.0 - Added a Sleep Journal with wake/sleep reasons. 1.2.5.0 - Show splash screen at program start. 1.2.2.0 - Attach an optional task (run a program) to a Wake Schedule. 1.2.1.0 - Added Wake Schedules, used to schedule daily/weekly/monthly wake timers. PrLog.org - MollieSoft Announces the Release of WinSleep 1.1.25.0. WinSleep © 2016-2017 by Marvin Hymowech.